← Will Erdogan Keep Speaker Çiçek’s Promise? 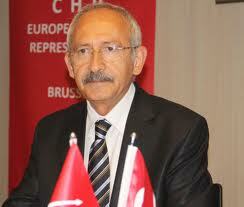 “During a visit to Bosnia and Herzegovina, main opposition Republican People’s Party (CHP) leader Kemal Kilicdaroglu stated his party is planning to write a new party program outlining the CHP’s policies that will reflect the changes of today’s world and said all political parties should update themselves or they will be enslaved by the status quo. Kilicdaroglu paid an unexpected two-day visit on Thursday to the Balkan country, a close regional ally of Turkey. During his visit, the main opposition leader touched on bilateral relations and strongly expressed his support for the Bosnian bid to join both NATO and the EU. In addition to his remarks on bilateral ties, he spoke of Turkish domestic politics and unveiled plans to enact a new program for the party. As he explained the plans and discussions regarding the new program for the CHP, Kilicdaroglu noted they cannot continue along social democratic lines while adhering to concepts and visions of the 1970s. “Political parties should update themselves or risk being enslaved by the status quo.” He noted that the leftist parties of northern countries such as Sweden and Norway have also updated their party programs. Kilicdaroglu said they will open a round of debates on the CHP’s new party program that will include journalists, academics and civic society representatives. “The program should be changed. It should be written clearly and concisely. Who reads a 350-page party program anyway?” he said. At a meeting between Bosnian and Turkish journalists on Thursday, the headscarf issue was discussed. In response to a question as to whether the CHP is on the verge of a structural transformation after Kilicdaroglu underlined the significance of the change. For the first time, the headscarved wives of lawmakers attended a reception held in Parliament for the celebration of National Children’s Day on April 23. The CHP did not criticize this action, a change from its position in the past that stood sternly against the admission of the headscarved wives of deputies in previous years. Regarding bilateral relations, Kilicdaroglu called on the government not to disappoint Bosnians who have great expectations fromTurkey. In a statement to Bosnian and Turkish journalists at the Radon Hotel inSarajevoon Thursday, Kilicdaroglu said Bosnialies at the heart of Europe. He said the prospects for Bosnia of membership in NATO and the EU is of critical importance andTurkeymust therefore continue to support its allies in such bids. He also urged the Bosnian government to ease the conditions for Turkish businessmen to invest in the Balkan country. During his talks inSarajevo, Kilicdaroglu indicated that Bosnians had urged the CHP to take a positive role in improving relations with Bosnia. Kilicdaroglu underlined that even though governments change in Turkey, the fundamental stance regarding relations withBosniaremains unchanged. He stressed that the most striking thing he saw during his visit in the Balkan country was the strong commitment of Bosnians to Turkey. Kilicdaroglu stated that the expectations of Bosnians should not go unmet”.